The New Orleans mini set consists of four 3.75ml bottles in a range of finishes; creme, satin and shimmer to be precise. Take a Right on Bourbon is a satin polish. The champagne shade needed three thin coats for perfect streak free coverage. I wasn't sold on this colour to start with however the more I use this colour the more I like it! Got Myself into a Jam-balaya, this is by far my favourite from the set. It's a beautiful peachy-pink colour with a creme finish. I found the colour easy to apply and two coats was just right. Show Us Your Tips! now this shade reminds me of the new Cinderella film. This shimmery blue with a hint of lilac is absolutely stunning and is a colour I've not seen OPI produce before. I'll certainly be buying a full size bottle of this little gem. I'm Sooo Swamped! is a gloriously glossy green (sorry that's alot of G's) I've not really worn green before but if you're going to add one new colour into your collection this Spring I'd make this the one. Coverage is fantastic and as I said it's super glossy. I love the OPI mini sets, they are the perfect way to have a selection of shades from the new collection without spending a fortune on the full size bottles. 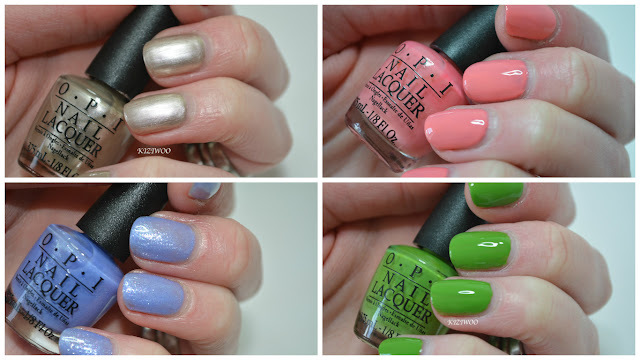 Have you bought any polishes from the New Orleans Collection? If so which colour did you go for? ?